"Truth Will Out! 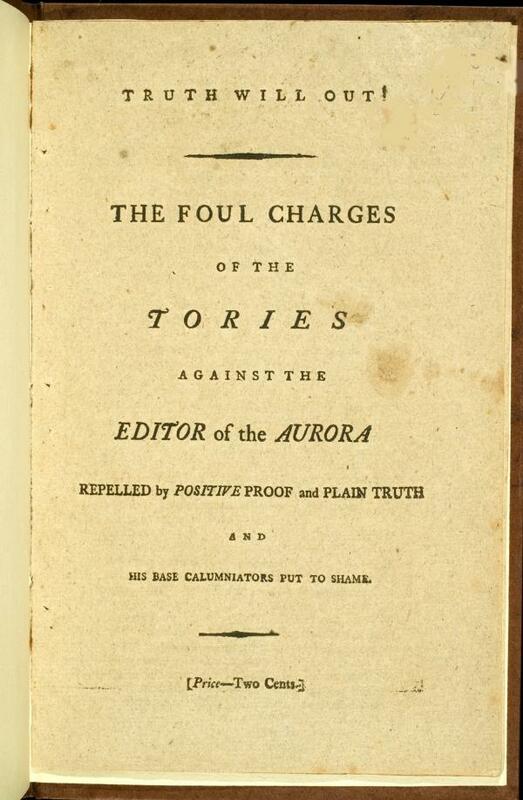 The Foul Charges of the Tories Against the Editor of the Aurora Repelled by Positive Truth and Plain Truth and His Base Calumniators Put to Shame," by Benjamin Franklin Bache, 1798. One of the most serpent-tongued journalists of the 1790s, Benjamin Franklin Bache, the only grandson of Benjamin Franklin, filled the pages of pro-Jeffersonian Aurora with vicious attacks on the Federalists and President John Adams. In this 1798 pamphlet, Bache denounced Adams so bitterly that Federalist pamphleteer William Cobbett "urged… that Bache be treated as 'a Traitor, a Jew, a Jacobin, or a Dog.'" Arrested under the Sedition Act for libel, Bache died of yellow fever before his scheduled trial in 1798.